You may recognize this encouraging quote as one that goes viral after tragedies like the horror of the Boston Marathon explosions yesterday. It circulated Facebook and the Internet after the Sandy Hook shootings, after the Aurora movie theater massacre, and after the Virginia Tech shootings that occurred 6 years ago today. We share and re-share this quote because it reminds us that in the face of these twisted acts of violence, there are people who drop everything to help, to heal, to save, and to serve their fellow man. Those are the people we should remember and emulate. Yesterday, we saw Helpers on a personal level—the observers who tended injuries and got victims to safety; the marathoners who continued to run until they reached Mass General to donate blood; the first responders and hospital staffs who saved innumerable lives through their tireless and valiant efforts; and many more, some whose contributions we may never know. We also saw Helpers on a corporate level: companies that leveraged their resources to help in other ways. Google, for example, launched a Person Finder specifically for the Boston Marathon Explosions, as well as prioritizing in the SERPs the Mayor’s Hotline for victims’ families and the Police hotline for witnesses. On the Google Person Finder, anyone can contribute status updates on victims or people who were in the area, and anyone can use the tool to search for loved ones. American Red Cross offered a similar service with their “Safe and Well” program, where those in Boston could register themselves as being Safe & Well for family members to see. And at the Sheraton Hotel, AT&T set up a mobile calling center and a phone charging station, as well as opening their WiFi network to subscribers of other carriers. 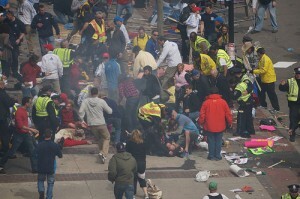 On social media networks, we saw even more aid and prayer finding its way to Boston. An extensive GoogleDoc made the rounds, alerting victims and families to spare beds, vacant couches, available transportation, and every other service that people could think to offer. It’s just incredible to see the outpouring of compassion and selflessness contained in that document. “So when you spot violence, or bigotry, or intolerance or fear or just garden-variety misogyny, hatred or ignorance,” he continues, “just look it in the eye and think, ‘The good outnumber you, and we always will.’” And didn’t we prove that yesterday? I believe we did. The Helpers were there, and the Helpers outnumbered the evil. This race isn’t over yet.